DESCRIPTION: If you like your metal smoking with rifftacular aggression, Lich King will wreck your stupid face. 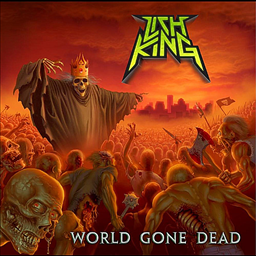 Lich King is a five-piece from Massachusetts... an east coast modern band with a west coast thrash metal sound straight out of 1987. "Act of War" is a song from the 2010 album "World Gone Dead" and is positively sick with headbangable riffs in the vein of Exodus, Slayer, Anthrax, S.O.D. and Vio-Lence. If you like old-school thrash metal, you'll like this song. You are judged and sentenced to burn!